The Boutique Shop offers a collection of magazines, literature, toiletries, travel items, postcards, clothes, handicraft and other items to purchase. Pre-dinner cocktails, briefings, lectures, movie nights, workshops and documentaries are hosted in the lounge or bar. Our air-conditioned library is well stocked with books, magazines, music and videos. Free seating is arranged in the restaurant. Learn the culinary delights of Khmer-Vietnamese cuisine at our cooking workshop. 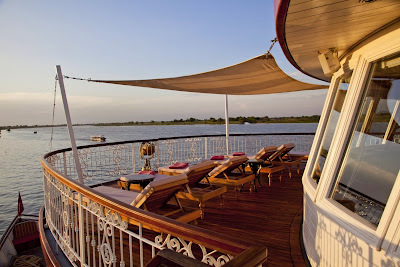 Smaller to mid-sized ships with a traditional Mekong cruise experience. These smaller to mid-sized cruise liners are accessible to more ports of call than larger resort style ships, offering more varied and interesting itineraries.